never too old to color: Wanna Snuggle? Doesn't this gator look like he's just waiting to give someone a big hug?! 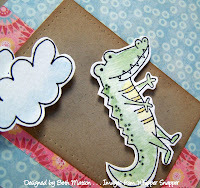 I stamped him and the clouds on watercolor paper and colored them with Watercolor Wonder Crayons and an aqua brush. The images were then cut out and mounted to the card with pop dots for added dimension. I used a green Twinklette marker on the spots on the gator's back for some sparkle. 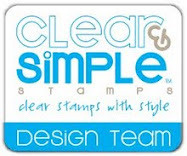 All of the images are from Whipper Snapper Designs. 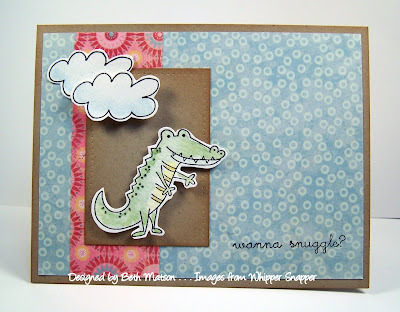 They are from three different Anna Wight cling mount sets - the greeting is from the Winter Schminter set; the cloud is from the Fish Friends set; and the gator is from the Little Critters set. Love how Anna's sets work so well together. Thanks for stopping by. I hope you're having a wonderful week!